A transport podcast I’ve just discovered is Transit Insight. There’s a key difference with this one: it’s run by, and features, people who actually work in the public transport industry. There are a lot of other good podcasts out there, but almost all of them feature advocates or academics. I’m working my way through their episodes, but last week I listened to this one: The Dirty Details of Keeping Transit Clean. They also talked about rubbish bins with solar power to compress the garbage. They noted the “BigBelly” brand, and said this reduced the need to empty the bins to a fifth the normal rate. 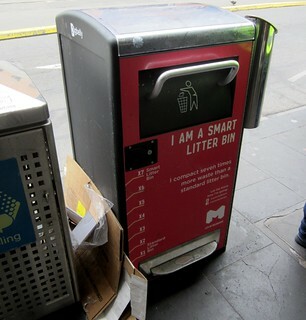 This got my attention, because I’d noticed the City of Melbourne is trialling these very same bins. There are several at the southern end of Elizabeth Street, and according to this article, several more in the Southbank area. While apparently they cost $6000 each, given some of the older bins get emptied up to eight times a day, it would appear they will pay for themselves. Presumably because they’re in high-traffic locations, any food waste stored in them won’t be in there long enough to become a problem. These new bins have sensors to phone home when they’re nearly full, so they can be prioritised for emptying — something also being trialled in 50 older bins as well. How well does this all work? I guess they’ll find out during the trial. Alongside smart toilets like the now common Exeloo, this is clever stuff… though evidently not smart enough to prevent people stacking recyclable waste beside the bins. And having written this blog post, I now feel like I know more about CBD garbage collection than I probably needed to know. All good but it happened and it’s almost done!